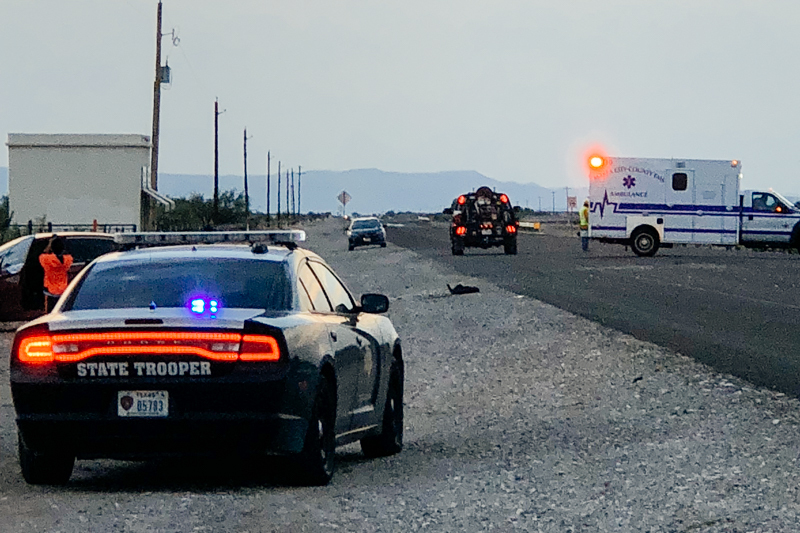 Recent attempts to make the Prada Marfa art installation site safer with Highway 90 traffic near Valentine proved ineffective after a 4 door sedan was struck from behind while apparently slowing to exit the road last week. There were several people in the two vehicles involved, and fortunately, no injuries were sustained, and everyone was released from the scene. The Advocate published an article in late June about safety concerns at the site addressed by State Senator Jose Rodriguez with the Texas Department of Transportation (TxDOT). Valentine Radio reported that the Senator had been contacted by constituents in the district having close calls with pedestrians standing on or crossing the highway. Some believe the TxDOT response of a reduced speed zone from 75 to 65 and yellow pedestrian signage in both directions to warn drivers, was not enough and now, it seems, there is some confusion regarding safe parking responsibilities per the official TxDOT agreement made when the installation was approved to be built. Chris Weber, Alpine Area Engineer decided to hand deliver the agreement to the Prada Marfa caretakers, Ballroom Marfa in Marfa, as a reminder that the agreement states that no parking will be allowed on a State right-of-way. The Assistant Director of Advancement at Ballroom, Peyton Gardner, told The Advocate he was sorry to hear about the accident but was glad no one was seriously injured and that Ballroom would be sending a letter of concern to TxDOT. In response to the multi-car accident last week, TxDOT will place no parking signs on both sides of the road at the location which will officially make it illegal to park on the pavement, and illegal to park between no parking signs on the right-of-way. Weber also discussed with Ballroom the possibility of placing rumble strips in the lanes approaching the art installation. TxDOT is also investigating the possibility of placing flashing solar-powered LED lights on the border of the pedestrian signs that are currently out there. All in an effort to avoid a more serious accident at the site.